Add a little zest to your Cinco de Mayo fiesta! 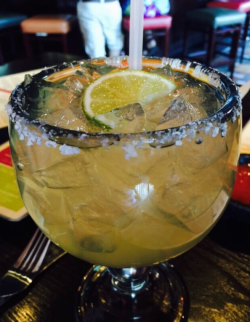 Here are some of the top spots for margaritas in Delaware. With a variety of margaritas to choose from, Agave’s pomegranate is the most popular, made with a combination of blue agave, citrus tequila, pomegranate liqueur and fresh-squeezed juices, it’s surely a drink to remember. Try this margarita with a side of guacamole. If you’re looking for a margarita with a bite, you can’t go wrong with Border Café’s Sauza Blue Margarita. Although just as popular as the mango “Margarita Grande,” the extra shot of premium tequila with a traditional margarita flavor is what sets the Sauza Blue apart. Although traditional margaritas are available, at La Hacienda, it’s best to be daring and try something new, like the Scorpion Margarita. The bar staff use traditional margarita ingredients like agave nectar and fresh lime juice but what makes the Scorpion special is a kick from chili-infused tequila. At Papa Grande’s, you can sip on a margarita true to your personal taste. The bar has a selection of more than 40 tequilas to choose from ranging from white un-aged to premium vintage. If you prefer your tequila without the salt and lime, try a flight of three different varieties. It’s a tequila-lover’s paradise. More than a dozen recipes are on hand at Santa Fe but for those who can’t decide, the Sangrita – a frozen margarita/sangria blend is a great choice but any frozen margarita will fare well, especially if you’re dining in the outdoor seating area. And the servings aren’t skimpy- most of Santa Fe’s margaritas are served in 18-ounce goblets.